You are here: Home / Artists page / Blog / Bergantino Artist Mitch Starkman shares his bass journey with us! Bergantino Artist Mitch Starkman shares his bass journey with us! Yes, I was born and raised in Toronto, CANADA. HOW DID YOU GET STARTED PLAYING THE BASS? I was 12 and already had been taking classical piano lessons since the age of 7…and very reluctantly at that time. I had also been listening to popular music on the radio and on records when someone I knew said that in the music I was hearing there was a “guitar -like instrument that had only four strings and played low notes”. Without even seeing or touching a bass I knew that was it..that’s where I wanted to be. It was like a huge light went off in my head and I was obsessed from that moment to find one and play it. It took another year for me to actually find one and put my hands on it, but I was sold sight- unseen. My first bass was an Epiphone Humbucker model that I rented from a local shop. It actually sounded great in retrospect… but I had no idea at the time! It sounded a lot like one of my “Bass Heroes” at 12: Glenn Cornick from Jethro Tull. Like most of you out there reading this, I wished I had that first one back. DID PIANO HELP YOU IN YOUR EARLY BASS PLAYING? Ultimately, immensely. Although my family would have probably disagreed with that considering the horrible noises coming from the basement in the first few years. It’s funny also that at that young age we didn’t have any concept of volume, and the effect it had on the victims around us. 🙂 But I’d have to admit at 12 the basic theory you learn from that formal piano education and ear training (plus the way music is laid out on a keyboard) gave me a huge head start in translating to the fretboard. Relationships and basic interval understanding was pretty much immediate and gave me a big head start. I continued with classical piano until I was 16 or 17 so the growth continued between the two. Although no one knew it, being forced to take piano lessons so early was one of the best thing that happened to me. I got into some early bands and then transitioned to doing mainly original music which was always my goal…being creative was always my main interest if I was allowed to do it. Early progressive rock projects transitioned to doing demos/sessions and in my late teens and into my early 20s I found myself the “in house” bass player for many studios of different sizes, working with various producers and generally just hitting the recording scene as hard as I could. I should say that at that time in music culture the push to concentrate on your own music and record it in a studio where you need session players was much stronger than now. Machines and smaller digital studios with samples hit pretty hard starting in the 80s. Then in my teens I discovered fusion, jazz, R and B, and funk/soul, getting into Weather Report, Headhunters, Return To Forever, Jaco and his band, and tons of other artists. That really began the process of maturing my playing and way of thinking (which never stops)… except for the dreaded “slap” that started to pierce the walls of my home and convinced the dog to never come downstairs again. WHAT DID/DO YOU LIKE ABOUT STUDIO WORK? The bright sun-lit rooms, the endless hours of getting a snare sound, the freshly prepared healthy meals, the bass always being way too loud on playbacks, and listening to every guitar through every guitar amp for every guitar part …while you were asked to just “plug in your Fender over there”…there’s so much! I kid, of course lol. Really, the challenge of trying to be creative and authentic in different styles is very stimulating to me, and that you really have to be a good listener and be on your toes. The environment makes you better technically too, and allows you to play with different people, which is fun. CAN YOU GIVE A BRIEF DESCRIPTION OF THE WORK YOU’VE DONE? I’ve done albums for major labels including Capitol/EMI, Attic Records, appeared on JUNO winning albums, commercial work, and numerous independent releases. I probably can’t count the number of demos also to add to that. 🙂 On the live side I’ve done the large arena, big stage, club circuit, and small venues of course. That is almost impossible to answer fully..not enough space. 🙂 Just off the top of my head would be Anthony Jackson, Marcus Miller, Pino Palladio, Jaco, Peter Cetera, Chris Squire, Nathan East, James Jamerson, Gino Vanelli, Ian Anderson, Paul McCartney, Steve Gadd, Ralphe Armstrong, Coltrane , Tom Johnston, Herbie Hancock and a hundred more including my wife who tells me when I should ” stop doing that”, and I listen because she has better ears than I do. Really, its anyone who has moved me in some deep way with their talent and expression. TELL ME ABOUT THE BASS R AND D INTEREST YOU HAVE. It’s really a fun side interest I fell into in the last 20 years or so that was fueled by the quest for ultimate bass tone. I began to analyze what makes a bass sound the way it does and at the same time hooked up with FBass which is fairly close to where I live. There was a good opportunity to explore and discover (by experiment) all the factors and elements that affect tone using our ears and hands as the tools, and trying to improve anything that we could. 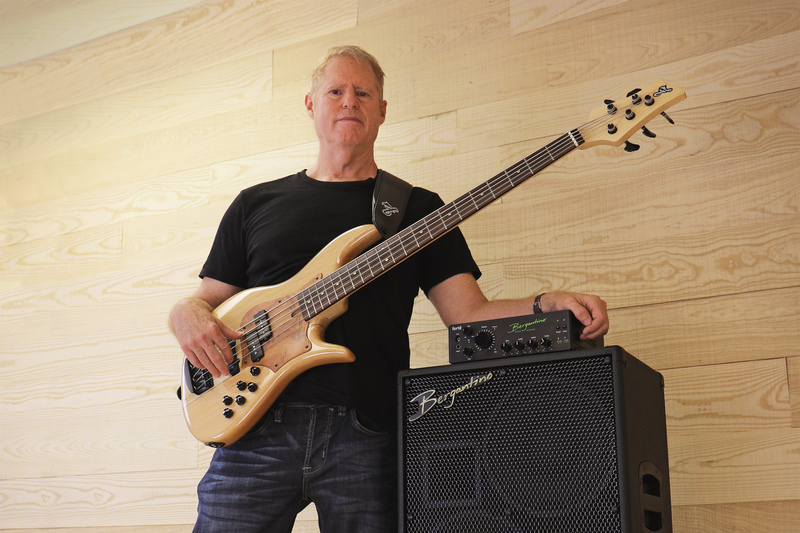 Bass is such a hands-on instrument, one where the relationship between the point of contact of your bare skin on your hand and the tone you eventually hear is so connected. That’s what makes it exciting for me to explore the R and D side to bass guitar. My R and D relationship with FBass remains up until today, along with being one of their artists. I’m also an artist for Alleva Coppolo Basses And Guitars and La Bella Olinto Basses, and have contributed to R and D for Alleva Coppolo as well. THOUGHTS ON BERGANTINO AUDIO SYSTEMS? I have a sensitive ear and am pretty particular on the way I like my tone. My bias is for transparency and a natural organic sound. This is the main reason why I’ve gone to Bergantino head and cabs. When I plug into this rig I hear my bass the way it sounds when I use a pretty direct recording chain. Although every situation or piece of equipment you plug into colours your bass to some degree, after years of hearing my instruments through a short recording chain I got to know how they basically sound like as instruments, and when I plug into Bergantino that’s what I hear. Sold! If I’m going to spend all this time and energy and money into getting the bass specs perfect for what I wanted in any instrument, that’s what I want to hear come out of an amp. I believe in getting the flavour of my tone from the bass specs and my hands, and the amp should just reproduce that as accurately as possible. Currently, when I do want to color my tone significantly I tend to use a tone shaping direct box with tubes or otherwise. WHAT BERGANTINO RIG DO YOU HAVE CURRENTLY? I have a Reference 2 10” cab, a Reference 1 12” cab, and a Forte head. This gives me a good combination of flexibility, bottom end, definition, punch, and transportability. I opted for the Forte because I’m not really a “wires” guy, I’m a wood guy, so although the features of the B amp are great and the digital interface works well I just want something simple and fast …plug in and play. That’s what the Forte was designed to do and it does it well. I love it for that. Again, the natural basic sound of this rig is accurate and transparent to my bass which is what it’s all about for me. WHAT IS YOUR FAVORITE THING TO DO BESIDES PLAYING THE BASS? I love to travel, especially to do mountain trekking or hiking. I’ve gone to Everest Base Camp in Nepal, and trek through the Swiss Alps regularly, now with my wife. We also love to be on wheels either bike or roller-blades. Travel and adventure are things that excite me, and I guess there is an analogy there with music and working with different projects. They are adventures, new or otherwise. Other things are aviation, hearing live music, and some relaxing time with the people around me. The important thing is to have passions and interests to keep your life varied and meaningful. I also believe these things can make you a better musician. https://bergantino.com/wp-content/uploads/2019/01/bergantino-logo-green-white-RGB-300x80.png 0 0 Bergantino Audio https://bergantino.com/wp-content/uploads/2019/01/bergantino-logo-green-white-RGB-300x80.png Bergantino Audio2018-09-26 10:42:352019-02-18 13:28:13Bergantino Artist Mitch Starkman shares his bass journey with us!